I feel like a turtle. I just want to continue the leisurely stroll of the holidays. Soak in the sun and contemplate life in peace and quiet. But I feel the push to start moving faster. We are almost three weeks into the new year. Can you believe it? … and then just enjoying life like a turtle. With all time in the world. So far so good. Dylan and I were exploring the Taylor Park again last week. 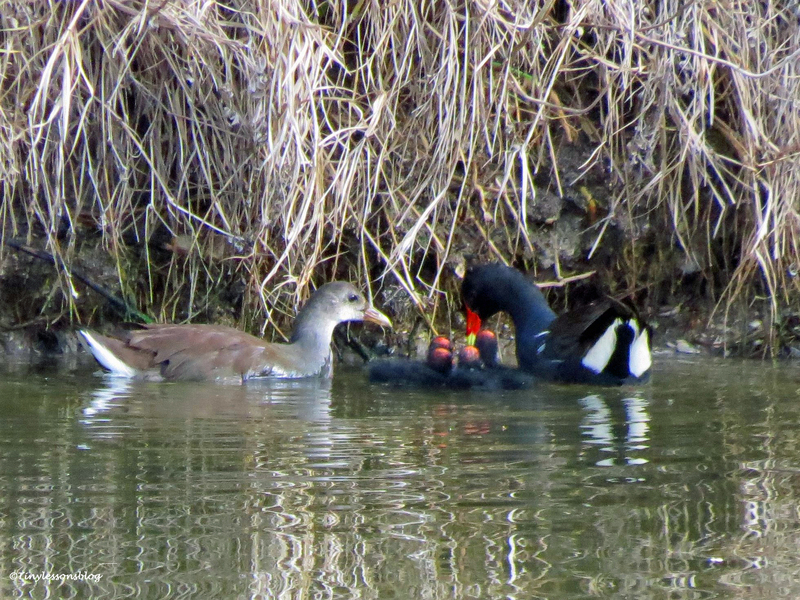 The Anhinga and the Moorhen were present in big numbers as usual. And we spotted many feathered friends looking for a tasty breakfast, like this Wood Stork, Tri-colored Heron and Little Blue Heron. We were trying hard to find at least one gator, but they seemed to be lying low(er than usual) due to the cooler winter temperatures we’re having right now. So instead we enjoyed spotting more birds, like this Ring-billed Gull and a Great Egret. Then we heard a loud group of Boat-tailed Blackbirds. The males were fighting in the reeds and refused to be photographed. But this female, who is actually brown and may have been the reason of the fight, stepped out to hunt for food. Click. There are always several Pied-billed Grebes on the lake and I love photographing them. But this cutie stretched my patience – and even Mr. Dylan’s who had to sit and wait for me. This little one was diving non-stop and staying up on the surface less than a second at the time. It was a comical exercise. There he is. Gone. Repeat. I got numerous pictures of bubbles and rings on the water and some tail feathers at times. But finally my patience was rewarded and I managed to snap a picture. Oops! That’s when I saw something in the water further out in the shady part of the lake. It was, indeed, a very quiet gator. After that discovery we ran our last stretch before leaving the park happy with our intermittent “osprey-turtle” exercise. But what about the salt marsh, you may wonder. We have been there too. After returning from my holiday trip to Sweden, I hadn’t seen much of the Osprey couple. They usually start their nesting season in early January by refurbishing their home, but it had been quiet at the nest. We walked past the nest on our way to the dog park and I thought I could see some signs of remodeling, but nobody was there. And I started to get worried. 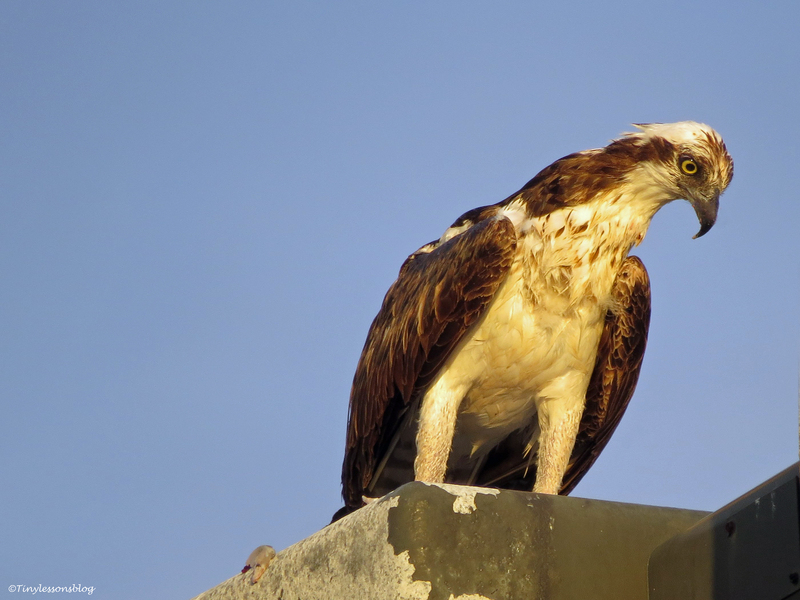 … and Papa Stanley eating on a lamp-post close to the nest, but hadn’t seen them together or working on the nest. Knowing that ospreys don’t opt for a divorce at the first sign of disagreement, I concluded there has to be some valid reason for their wait. I grabbed my camera and out we went, my assistant and I. I was hoping the happy couple would still be there and the light would be enough to capture the evidence of this romance. And we were in luck. Both Sandy and Stanley greeted us with a friendly nod. 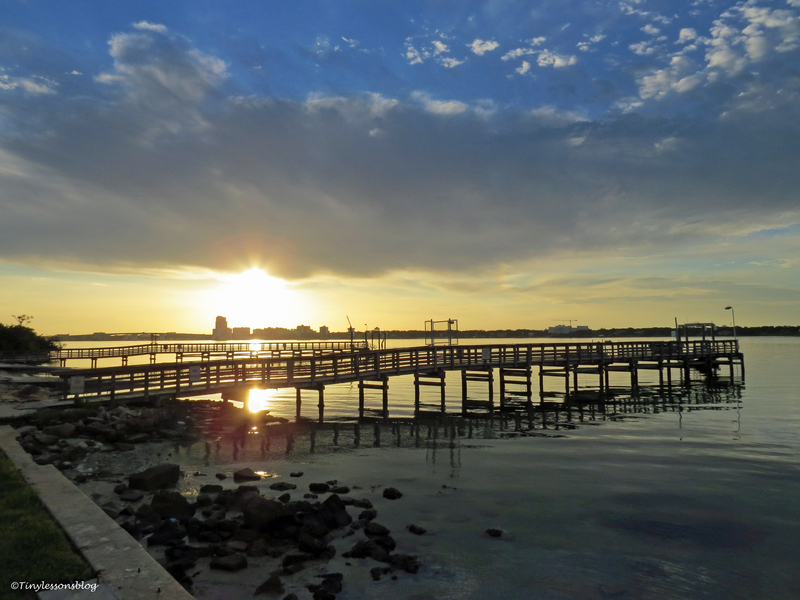 …and we also spotted a a Snowy Egret and a Great Egret down at the water’s edge. So finally, and quite late this year, mama and papa osprey had come together to start their nesting season. The sixth one I look forward to observing. Earlier this week, Dylan and I visited the dog park on a cool, partly loudy day. And discovered the little salt marsh village was lively indeed. The Mayor was in the office and surveyed the marsh in his typical, calm manner. Further out, in a difficult spot to ‘shoot’, several residents were huddling to seek shelter from the cold wind coming from the north. Even the Clown, aka Reddish Egret was calm, with no intention to perform. 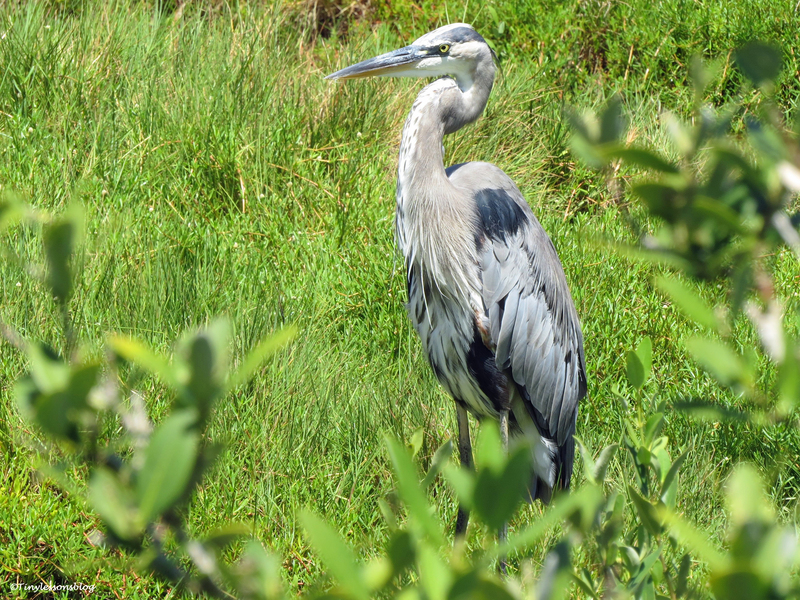 Maybe his enthusiasm was dampened by the presence of the Wood Stork, who had only recently given him a lesson. But he couldn’t help himself, he had to follow the bigger bird into the water and keep him under surveillance. Closer to the Osprey nest, at the east end of the marsh, Several residents had sought shelter in the bushes. I was happy to see the Snowy Egret had already developed a breeding plumage and to spot both a Black- and Yellow-crowned Night Heron for the first time in quite a while. Most residents seemed to be back from their holiday travels. …and watched us with great interest. Or maybe it was bride. In any case, I promised myself to make time to follow their, hopefully successful, nesting season in my “turtle time” between travels. Thank you for being here. Be good and keep warm. Sunrise Walk with Surprises. Both Good and Bad. This morning I woke up to a glorious pre-dawn glow. I felt I needed exercise and decided to head out for a walk. While it was still cool. That’s a relative term here in Florida, of course. 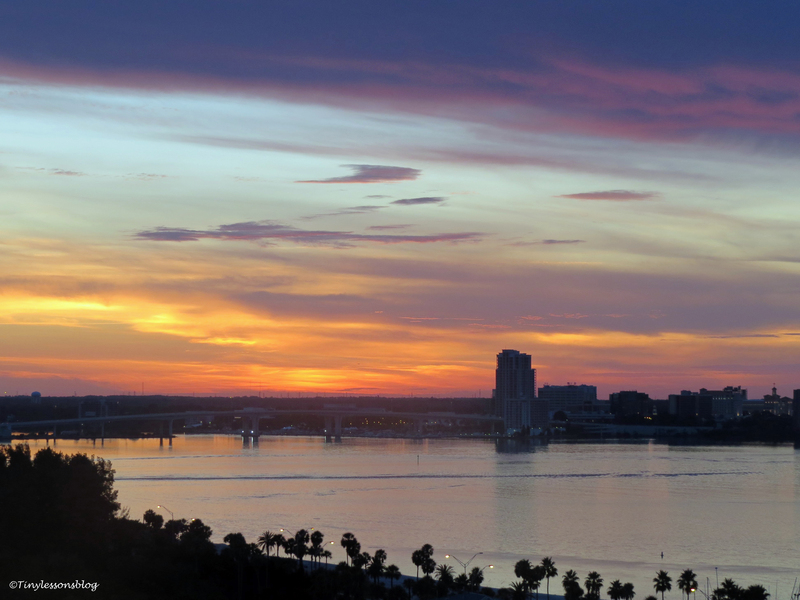 Pre-dawn sky over the bay. This first morning after the July 4th weekend, I wanted to check on the birds after all the fireworks on the beach and around the bay on Saturday, and even on Sunday. 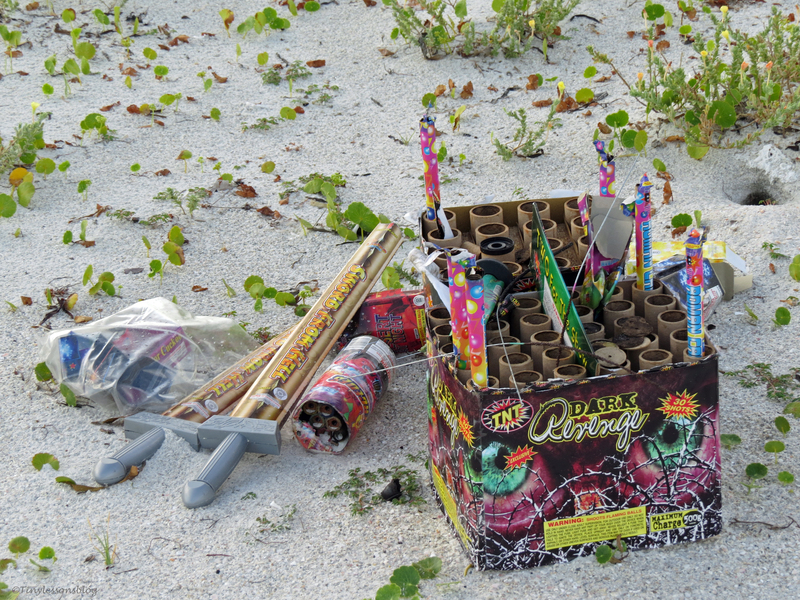 I was hoping my feathered friends had been huddling in the salt marsh during the festivities, and not flying in the path of any of the hundreds of “rockets” reaching for the skies. 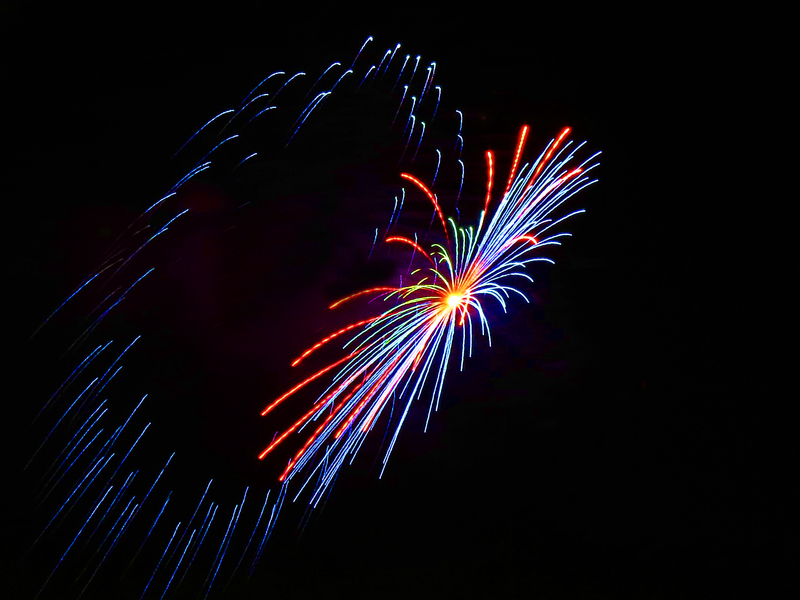 July 4th fireworks over the bay. The salt marsh was quiet and serene. Just me and a few birds. 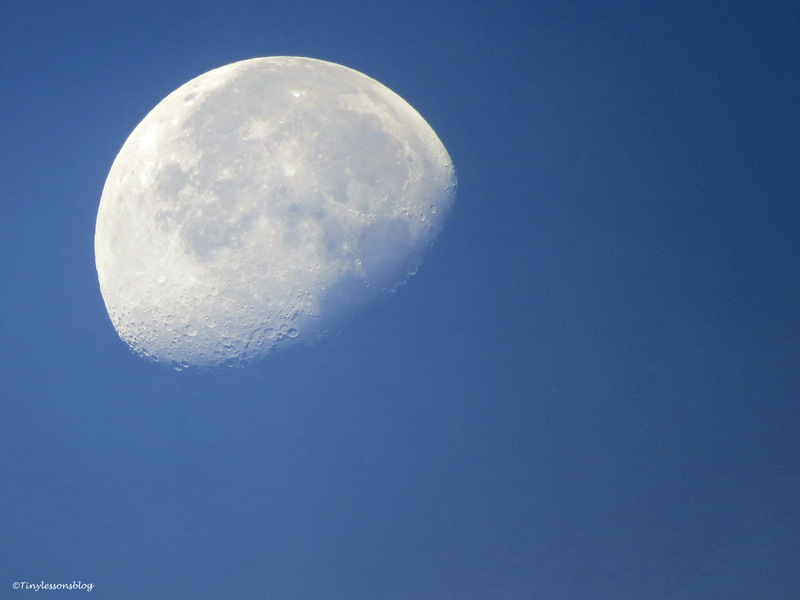 And the sun trying to peek over the horizon, while the moon was still hanging on high up in the sky. 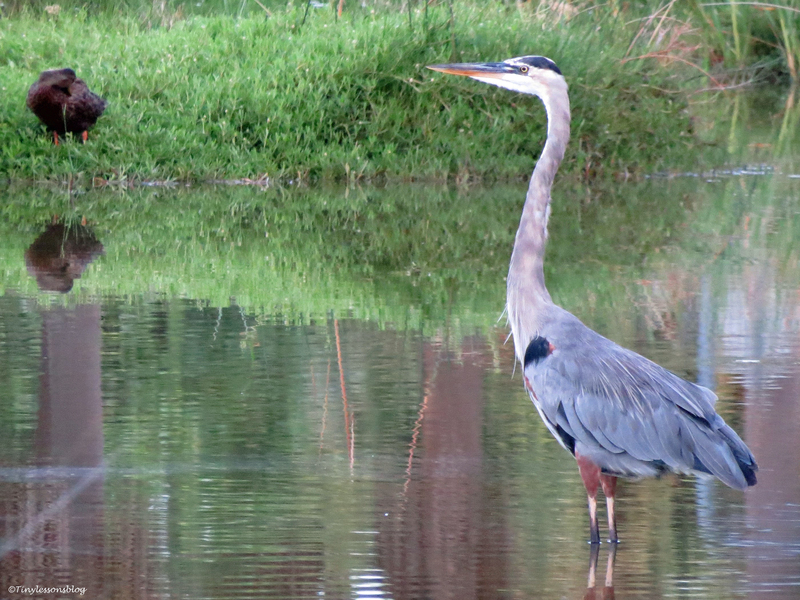 Many of the residents were sleeping in their hidden night quarters, but the Great Blue Heron was already patrolling the shallow waters. 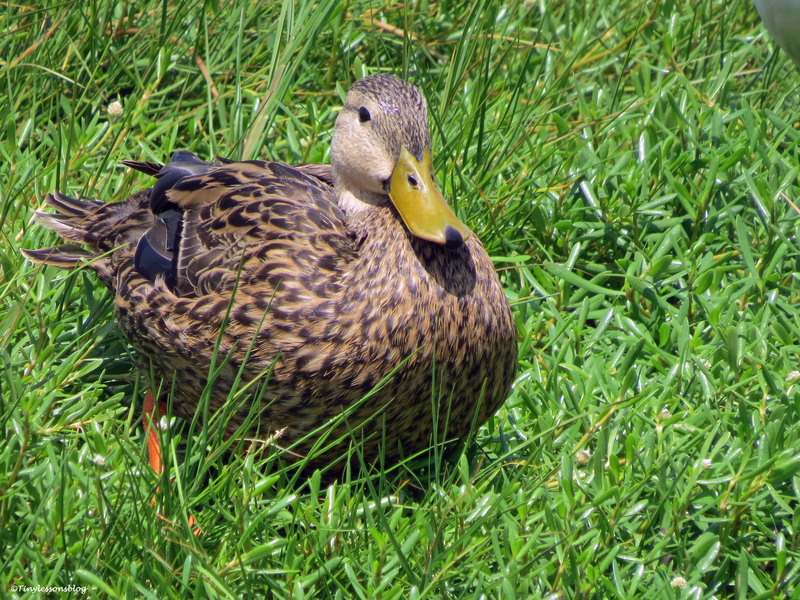 And so were the Florida Mottled Ducks. I think these might’ve been juveniles from the brood I spotted in April. 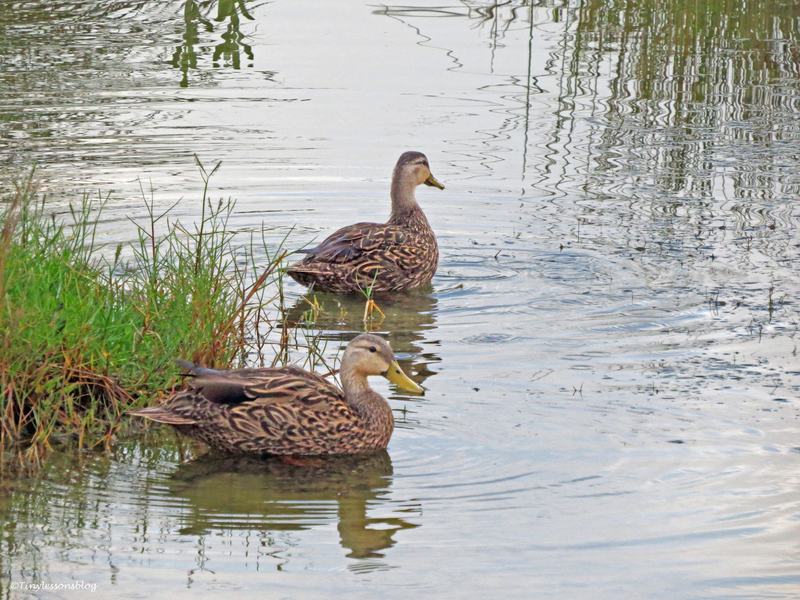 …and so are the young ducks. 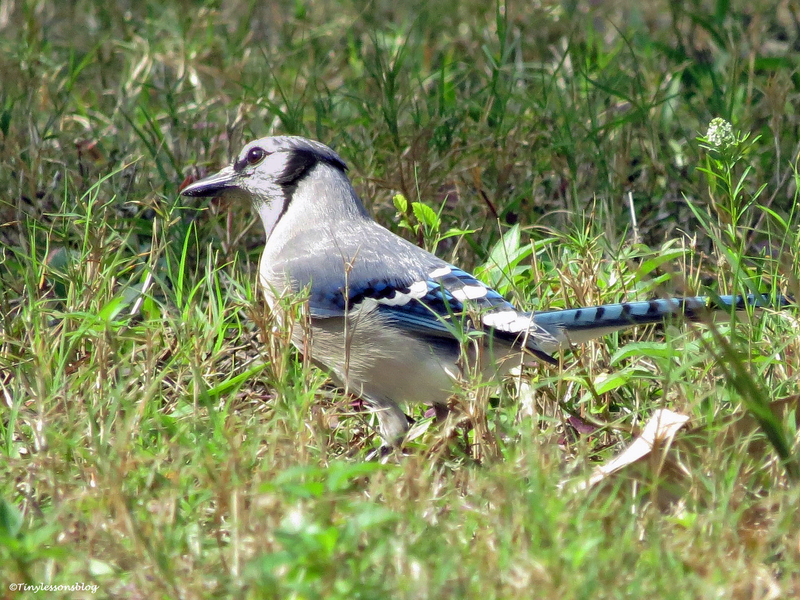 I also spotted a bird that I couldn’t identify. My friend H.J. 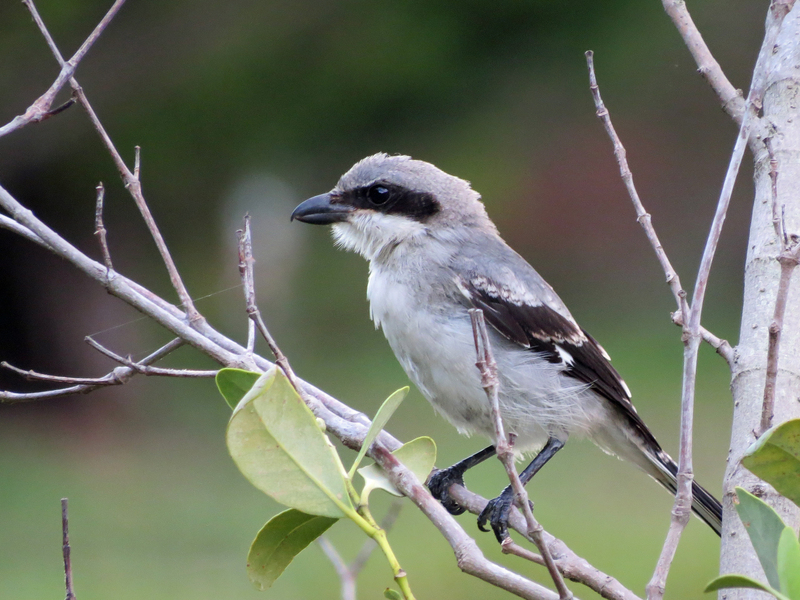 thinks it might be a Mississippi Kite – thank you! 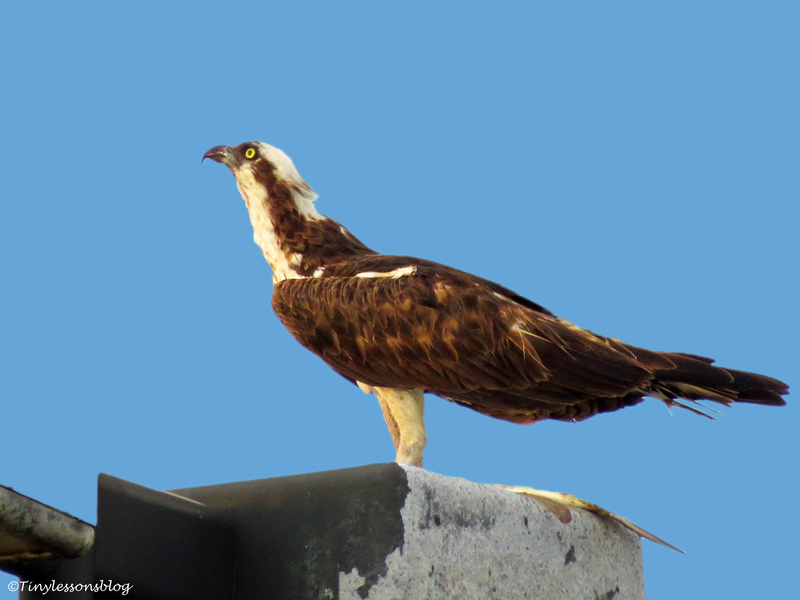 Seeing the empty nest reminded me that I thought I’d seen Mama and Papa Osprey flying together on Saturday afternoon. I’d had my binoculars and made a positive ID on both. 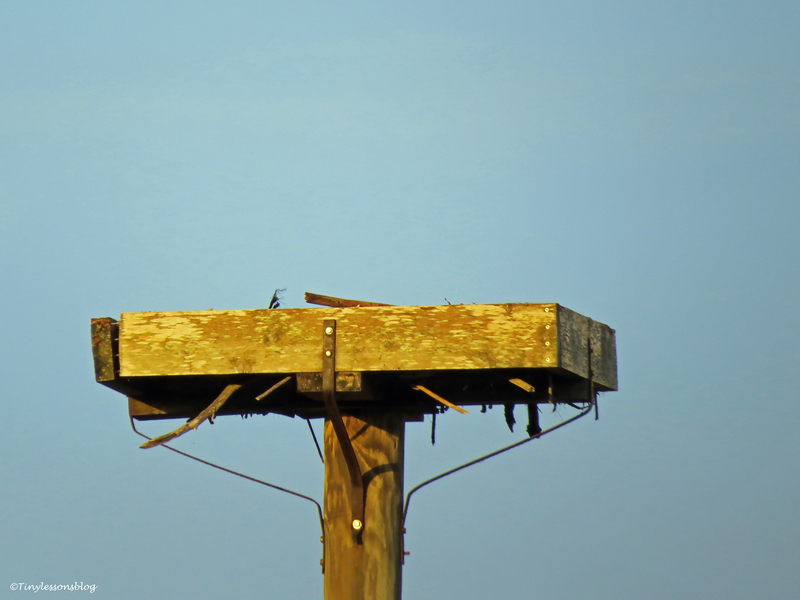 The empty Osprey nest, now barebones after the storm mid June. I decided to walk onto the bayside to see if I could find them. I walked past the Sailing Center where Papa Stanley used to have his feeding perch when Sindile was still in the nest. He was not there. I admired the bay basking in newly acquired sunlight, when I spotted Mama Sandy on a lamp-post close to the sea wall! She’d gone away when the two older chicks left the nest, about three weeks ago. I’d been right when I saw the two of them. She was back! Mama osprey is back! I missed to check what she was looking at…maybe it was Papa flying by. She was turned towards the rising sun, drying her still wet feathers, and eating a big fish with great appetite. And she didn’t look like she’d been on vacation. Her crop looked empty, and she had lost even more weight from the time I last saw her. She may have followed the chicks and been teaching them how to fish…getting very little food for herself. Mama Sandy at sunrise, still wet after her breakfast dive. Now she was back to keep an eye on the nest, exactly like last year. I left her eating breakfast and walked across the marsh back to the beach. 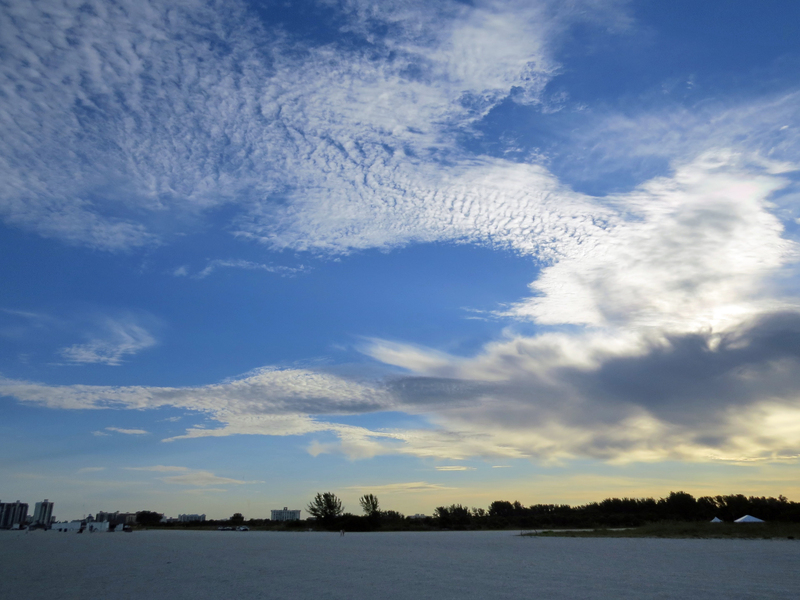 Early sunrise sky as seen from the beach. In addition to many gulls, I spotted a Ruddy Turnstone, and a Willet. Both were running back and forth at the water’s edge, busy getting breakfast. 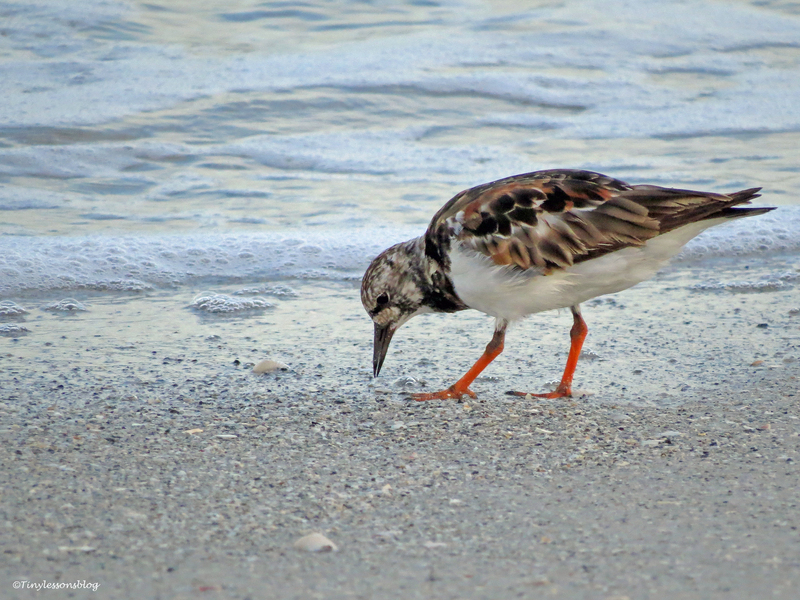 A Ruddy Turnstone on the beach. 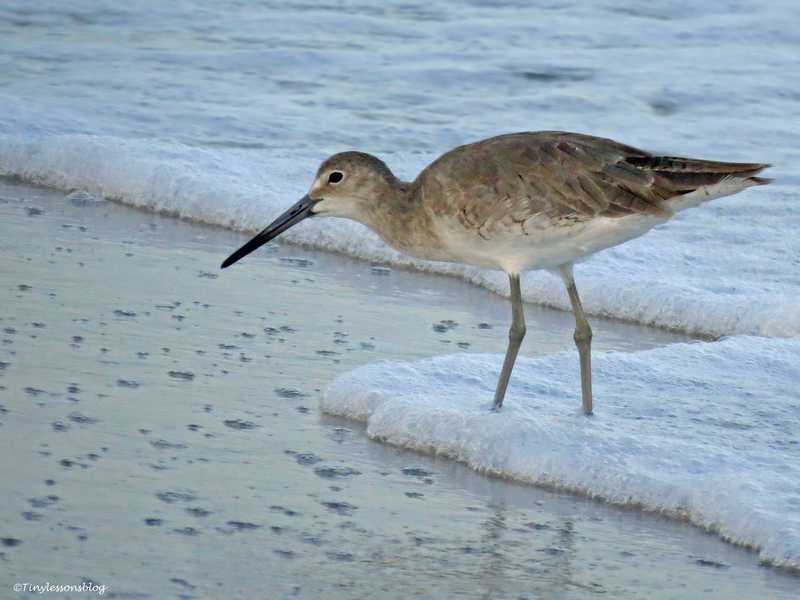 A Willet in the waves. But I also found something left behind by much bigger, and supposedly wiser, bipeds. TNT Dark Revenge. Very close to a clearly marked Sea Turtle nest. Frustrating, and dark indeed. I’m just hoping the bangs didn’t disturb the 100+ eggs recently laid there by Mama Sea Turtle. 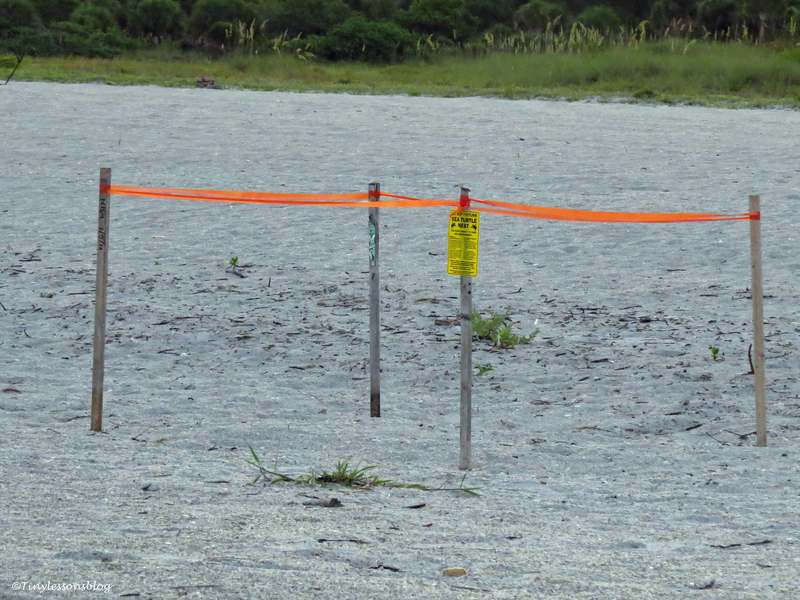 …next to a marked Sea Turtle nest. Mother Nature is amazing, but her caretakers not always so. Luckily She is quite resilient. Constantly producing new life for us to enjoy. 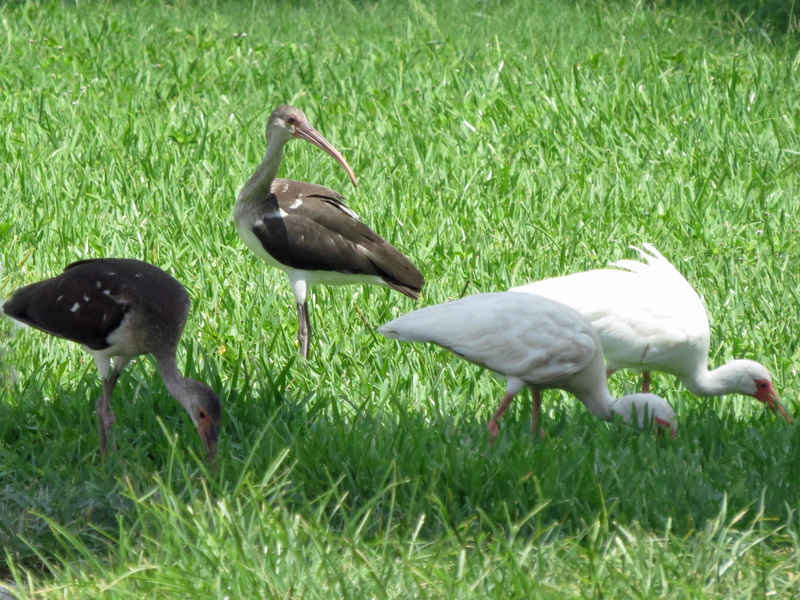 Like this blue-eyed juvenile Ibis and these fluffy Moorhen babies, both spotted over the weekend. 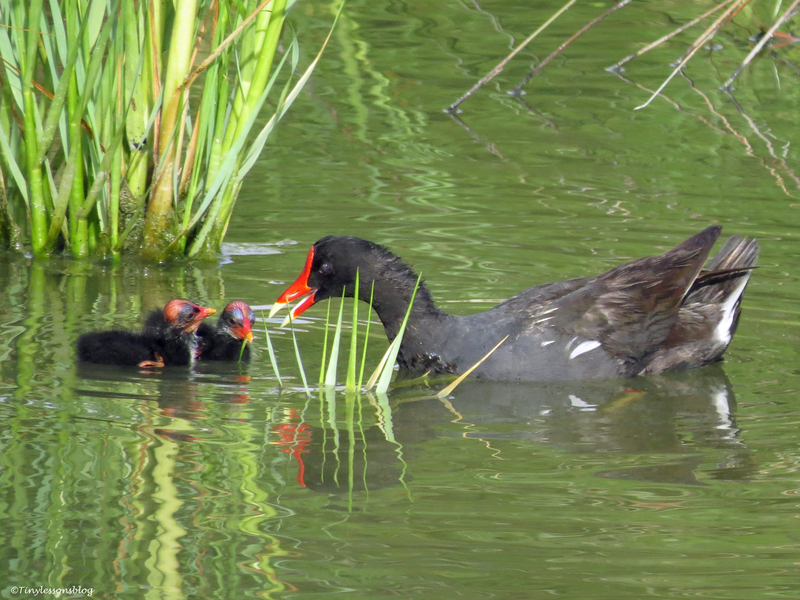 Moorhen chicks listen attentively to their Mama. Thanks for coming along. Have a great rest of the week. Chasing Ancient Birds. In My Dreams. There I was, walking around at the pyramids in Giza in ancient Egypt. A few thousand years ago. With my latest Canon. It was hot and hazy, but the heat didn’t bother me. I felt happy and light on my foot, smiled at everyone I met. They were mostly traders returning to Cairo with caravans of fully loaded camels. I was over the moon because I had managed to snap a picture of a Sacred Ibis. 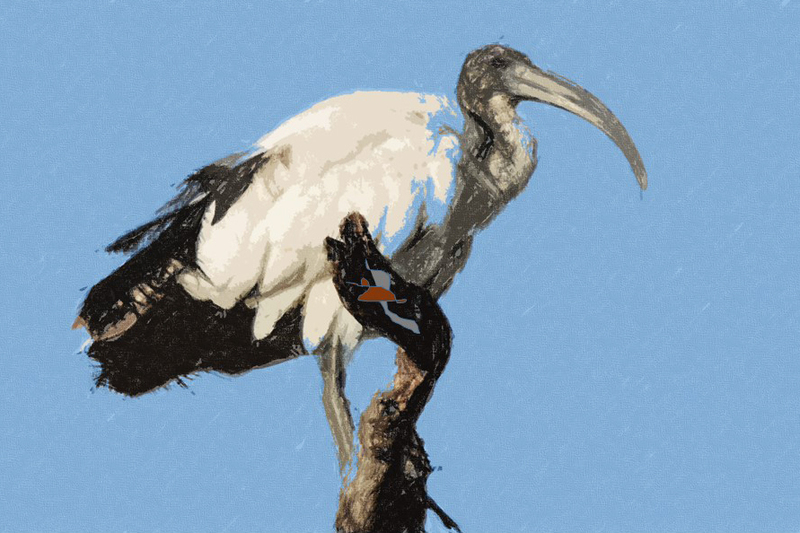 Sacred Ibis, my artwork based on a stock image. That bird was Thoth’s favorite. And Thoth represented many things important to me: knowledge, writing and justice. Even a little bit of magic. I had never seen him in person, of course, but he was pictured everywhere with a head of an Ibis. 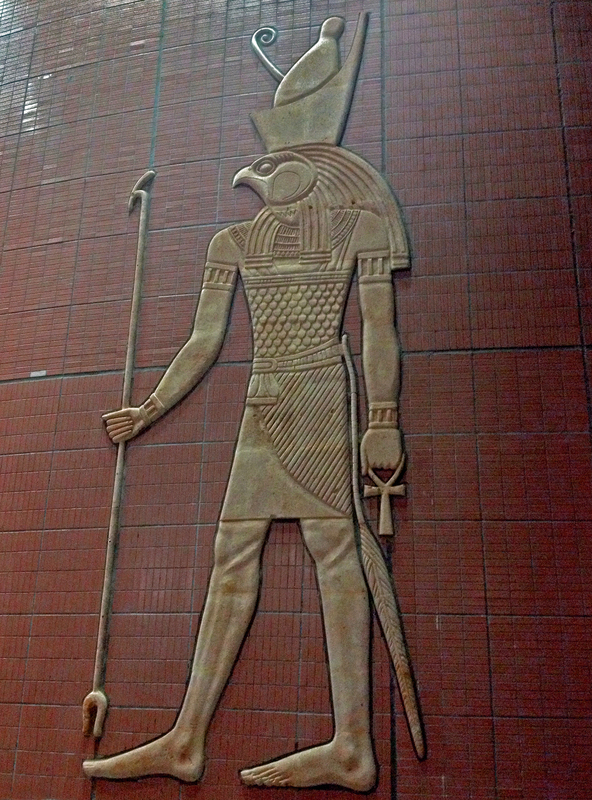 Thoth, pictured on a wall in Cairo. 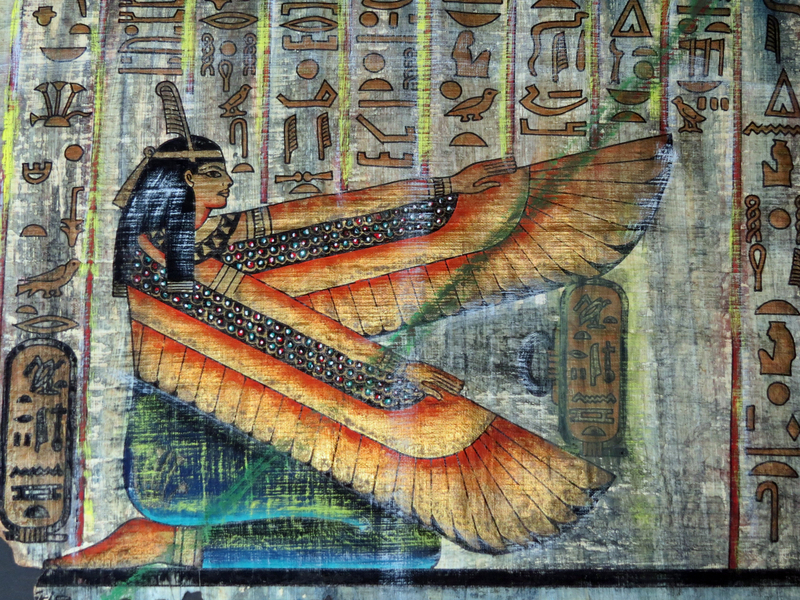 The Sacred Ibis was also the first letter in the hieroglyphic alphabet. 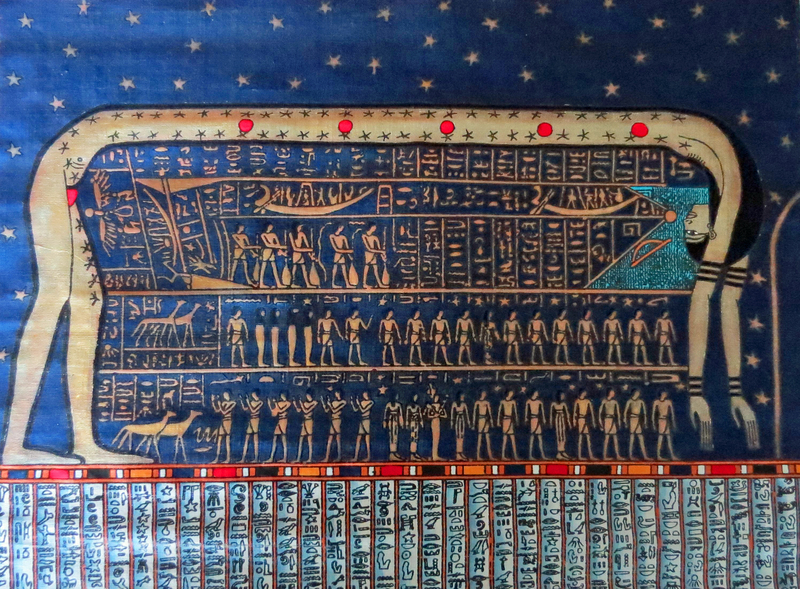 An important symbol of writing and preserving the stories for the afterlife. After getting my all important shot, I went to see the scribes and artists in the nearby village. 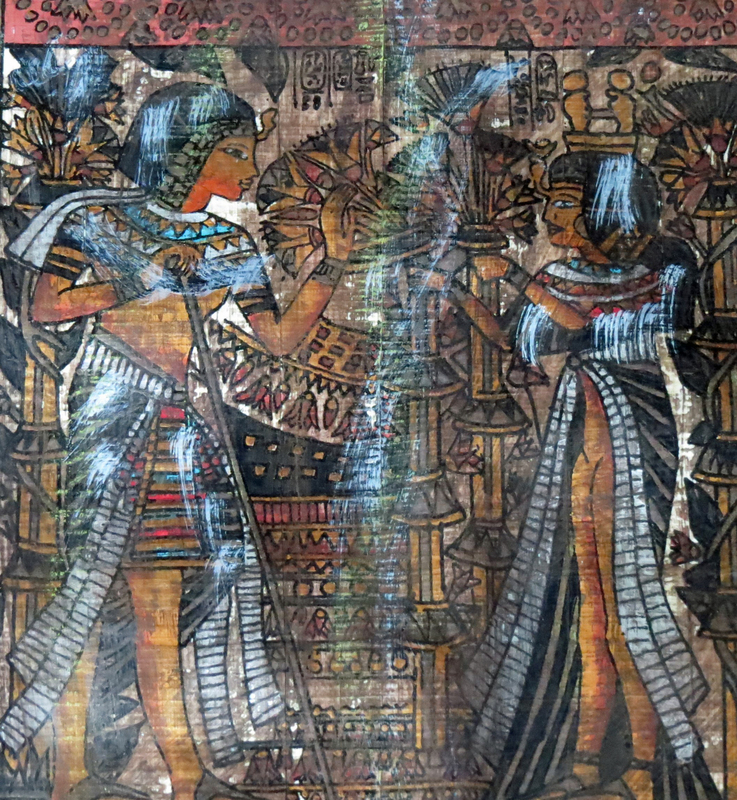 Some of them had simple workshops, but many were writing, drawing and painting on their papyrus rolls right in the open. Their art was nothing short of amazing. I tried to buy a few art works but somehow my paper money didn’t do the trick. So a few of them took pity on an art-hungry stranger and gave me samples of their work for free. I was grateful for their kind gesture. After receiving the rolls, I said my goodbyes and walked back to the pyramids. I asked one of the guards to take a picture of me. 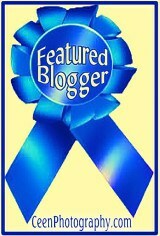 For my blog, I told him. To my surprise he didn’t even ask me how to use the camera, just snapped the picture and smiled. He was more interested in my camera bag of soft leather, and asked who’d made it. I said I didn’t know, but that it was probably made in China. He thought it was funny and burst out laughing. He couldn’t fathom that there was no art work on it. Tiny at the pyramids in Giza. Soon after my picture was taken the wind started blowing. A sand storm was approaching. Still remembering the previous storm, I didn’t want to get another sand corn in my eye. So I decided to return to Mena House, my accommodations for the night. Suddenly I woke up. The sun was shining in my face. 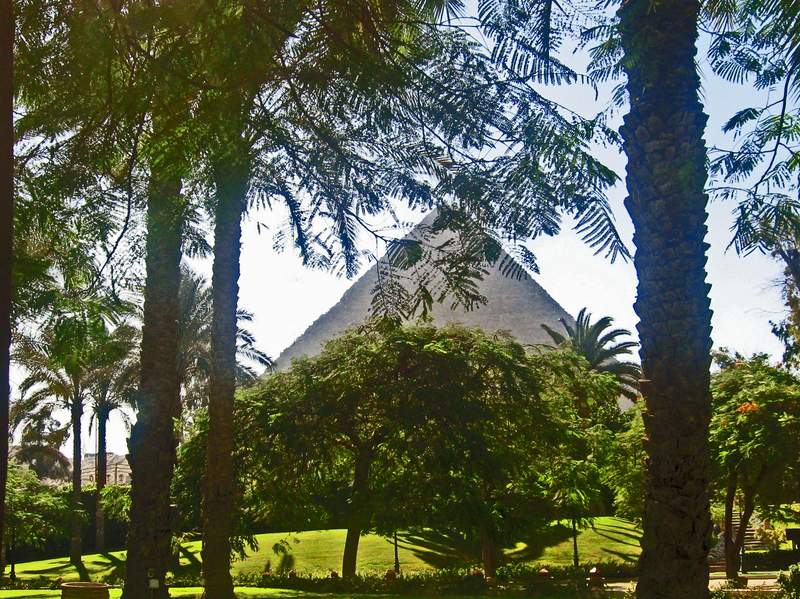 I wanted to go for breakfast in my favorite spot, out in the gardens facing one of the pyramids. But found myself back in my bed in Florida. My hubby was already up, Bumble was still snoring lightly next to me. It took me a while to wake up to my current realities of a new week in the 21st century. And I couldn’t help but wonder where this pleasant dream had come from. My hubby of course has a theory. I hope your week has started well. 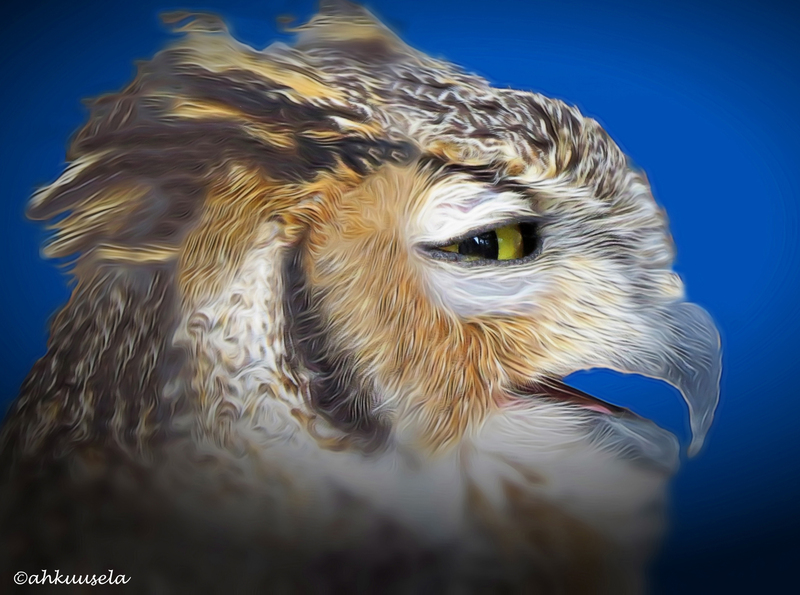 Wordless Wednesday: Different. Yet Still the Same. My lunch-time walk in the nature reserve was so much fun today! Here is one short snippet, others will follow later. 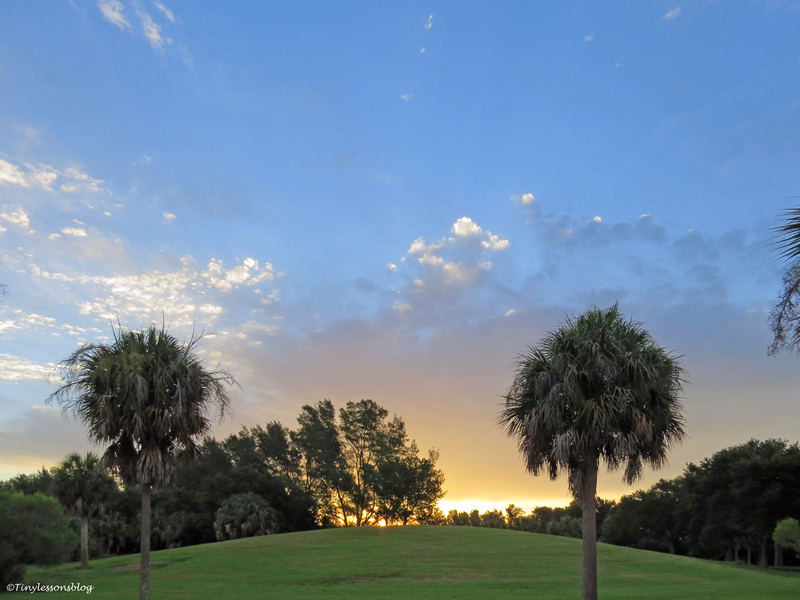 This one little island, or rather a patch of grass, in the marsh has become really popular among residents and visitors alike. Today, walking towards the osprey nest (you can see the nest pole in the upper right corner), I saw at least ten birds gathered there. And became a witness to a funny incident. Lots of grooming was going on. 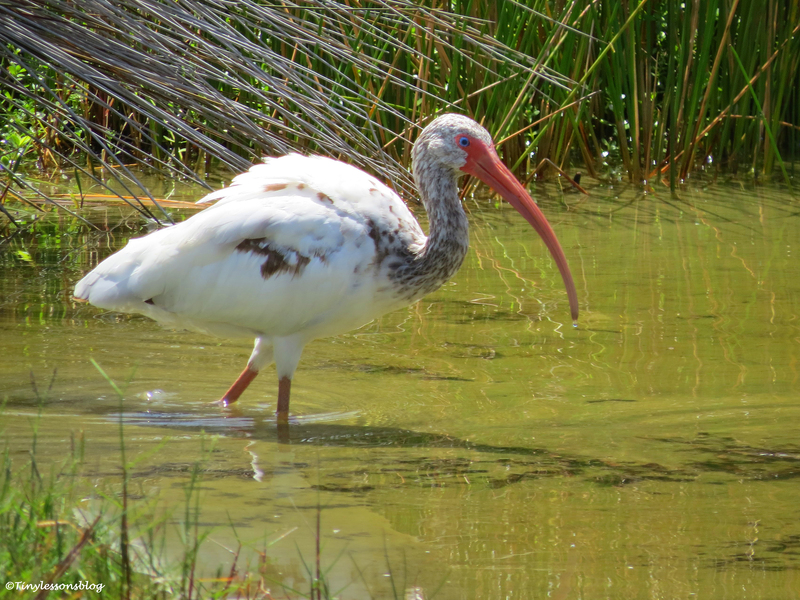 Every bird was making him/herself beautiful, the roseate spoonbill and the ibis were no exceptions. And acted with lightning speed. Ouch! Did you just poke me ibis? No….it wasn’t me. I’m minding my own business. Tiny, you didn’t see that, right? 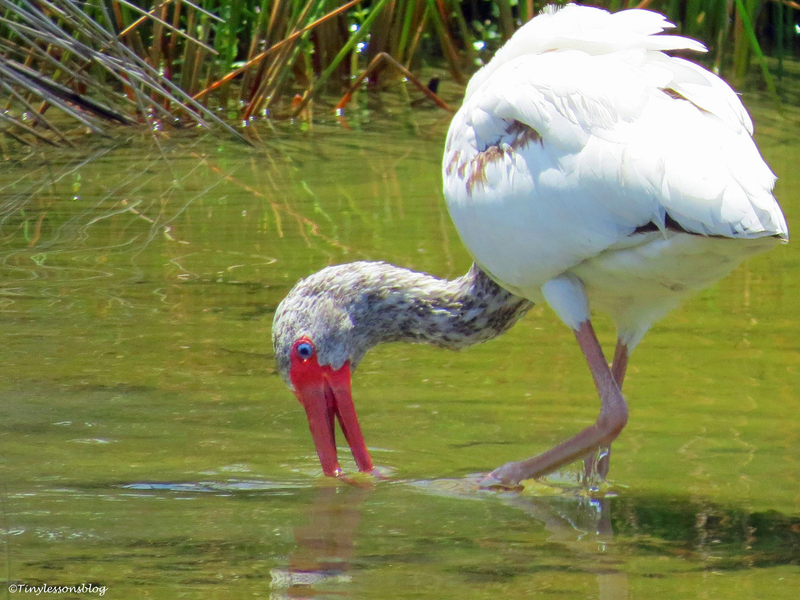 Then the ibis looked straight at me. As in asking whether or not I had witnessed the incident. When I told him I did capture it all on camera, he got a little upset. I told him he needs to own up to his actions, but I didn’t mention I intended to share the pictures with you. He didn’t ask. I am puzzled. 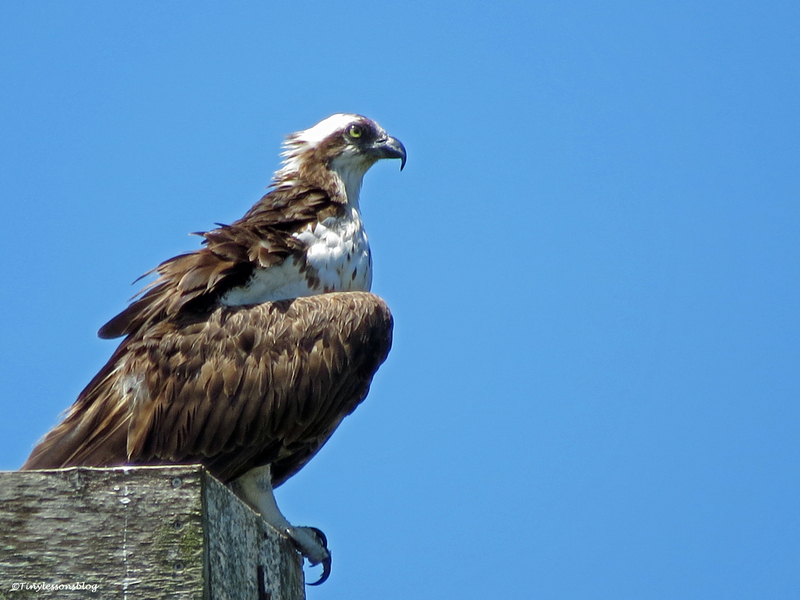 I’ve visited the osprey family four times in the last one week. I had expected to see the young lady do frequent flying practice, but that hasn’t been the case. Regardless of the timing and length of my visit, I’ve found mama osprey and the nestling sitting tight in the nest. Deeply involved in discussions. Do you hear me mama? I’ve witnessed a wide array of vocalizations, from pleasant discussion tones to loud shouting matches between mom and daughter. To the point that I’ve rummaged the internet for a rosetta stone version in osprey language. No luck so far. Shall we talk or shall we fly? The other day both mama osprey and the teen did some wing exercises in the nest. 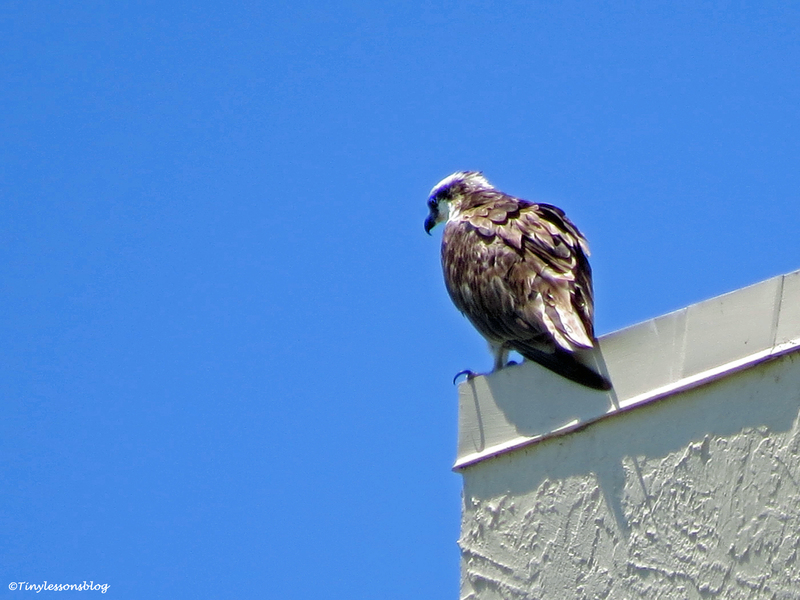 The nestling was flexing, but did not fly, and mama osprey did some Pilates. Lots of stretching going on, and lots of communication. On the top of that, papa osprey has not shown up during any of my visits since more than two weeks back. Last time I saw him, he came empty-handed and mama osprey flew away immediately. Is there a rift between the parents? Papa sleeping on a couch somewhere? Or did something happen to him? I have no way of knowing. This morning I went to see them much earlier than I usually do. First I saw only mama osprey. I was hoping the nestling had finally gone out for flying practice, but then I saw the breeze lift up a few feathers and discovered a brown back in the nest. The youngster was still sleeping! At 10:30 in the morning. Soon the teen woke up and slowly stood up. The dialogue they have been having every day since last Sunday started almost immediately. I waited and waited. No flying practice this morning either. But I noticed many new decorations hanging down from the nest. And the balcony flowers were still alive and well. I started to get worried and wondered if something was not right. I decided to check on them more often from my terrace (using our strongest binoculars) to see if the youngster would fly at all during the day. To my delight I saw her flying two short rounds fairly close to the nest late this afternoon! She didn’t soar high like her mama as yet, but at least these practice rounds were a bit longer than what I’d seen her do earlier, a few minutes each. So I’m hoping everything is alright. And that fishing lessons will follow. Family life can be complicated indeed. I have to tell you something else. The other day I saw yet another bird I haven’t seen in the nature reserve before: a tri-colored heron! And today I witnessed a “crowd” of four different birds on a little island in the marsh. The vacation season has started. Lots of demand for prime real estate with water views. 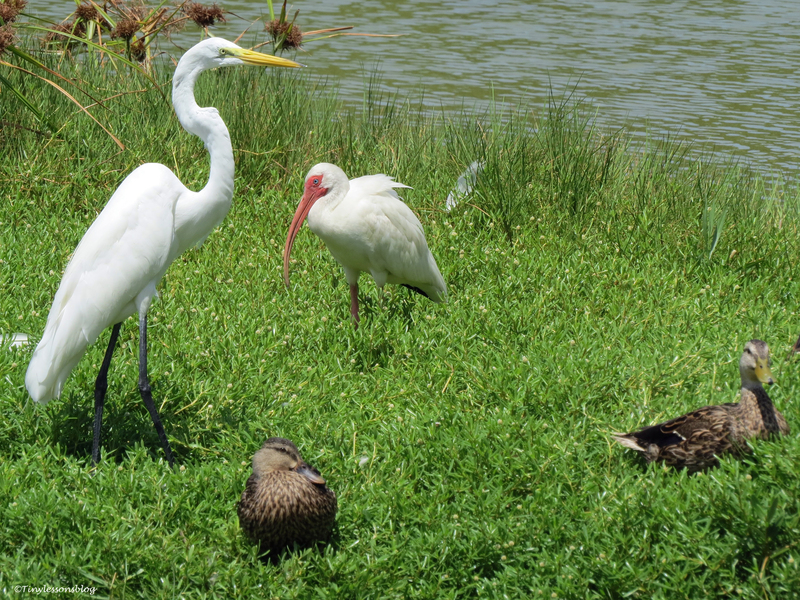 Four different birds on an island: small blue heron, small white egret, roseate spoonbill and two ibis. Will keep you updated on developments. Hope your week is going great.